There are four different types of wetland marshes in Louisiana. Due to Louisiana’s proximity to the Gulf of Mexico, the exchange between fresh and salt water along the coast is frequent. Depending on the location of the marsh, it could be classified as either freshwater, intermediate, brackish, or saltwater marsh. 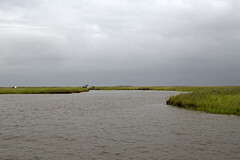 Marshes are categorized by the salinity, or salt content, of the water, and the location of marshes to the Gulf of Mexico often directly correlates with the salinity level. 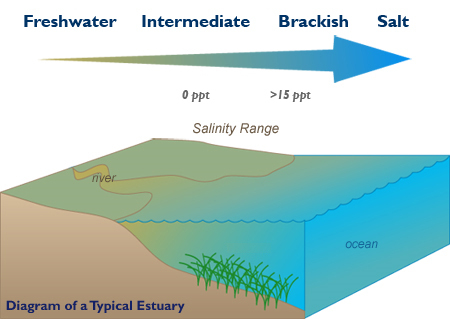 Generally following a salinity gradient, freshwater marshes are commonly situated furthest inland from the gulf with a salt content of 0 ppt (parts per thousand), intermediate marshes contain a salinity range of 0-5 ppt, brackish marshes have a range of 5-15 ppt, and saltwater marshes encompass a salt content of 15 ppt or greater. Within the marsh gradient are estuaries, where fresh and salt water mix and many wetland species spend their juvenile lives.